The RT9114B is a high efficiency, I2S-input, stereo channel audio power amplifier delivering 2x20W into 8Ω BTL speaker loads. It can deliver over 90% power efficiency and eliminate the need for heat-sink. The built-in anti-pop functions can reduce the speaker′s pop noise under all kind of scenarios. Built-in protection circuits can provide over-temperature, over-current, over-voltage, and under-voltage protections and report error status. The RT9114B is an I2S device receiving all clocks from external sources. It can support both master and slave mode with wide input sampling rate from 8kHz to 96kHz. 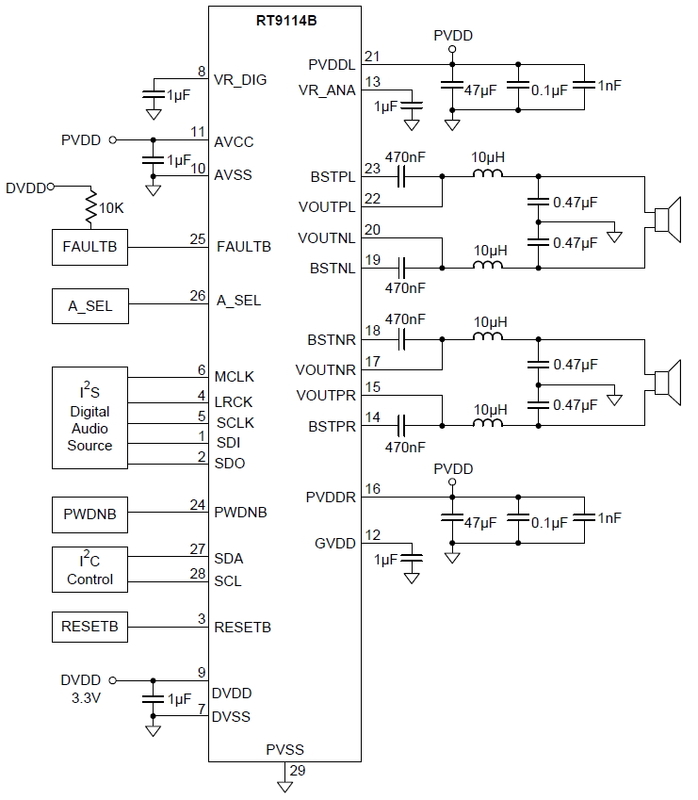 A fully programmable data path routes these channels to the internal speaker drivers. The RT9114B features three band DRC and flexible multi-band biquads for anti-clipping, power limiting, and speaker equalization.